Two days of listening to Bon Iver (the new album) by Justin Vernon’s synonymous band. Part of me admires this guy for evolving, for moving on and not capitalising on what he achieved with ‘For Emma, Forever Ago’ three years ago. Yet another part of me is sad; all that made “For Emma” the jewel it is, is all but gone from this album: the emotion, the pain, the pure, unadulterated sound and simplicity of Vernon’s voice + his acoustic guitar. Without arrangements, without electronics and fx*, without guest musicians or overengineered sonic landscapes. 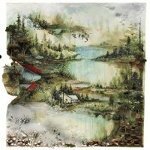 That’s where ‘Bon Iver’ is different to its predecessor and so much like other contemporary indie/folk albums: there may be some glimpses, sporadic moments of brilliance that reminded me why I liked the band in the first place, but as a whole it’s an average album. But then again, it is clear to me that ‘For Emma’ was the exception, not only because of how it was produced (the product of a three month seclusion at a cabin in northwestern Wisconsin), but also because of the ripple it created exactly because it was so authentic yet so different to everything else that made it stand out. In that respect ‘Bon Iver’ is nowhere near ‘For Emma’ territory, but still an album that showcases Vernon’s songwriting ability and unique voice. * Ok, there is some autotune in use in For Emma..But it really doesn’t detract from the statement above.